This is the first part of my series God is speaking. Can you hear Him? And this week I’ll be discussing what prevents us from hearing God. 1. We can’t hear God’s voice if He isn’t speaking. Therefore, God is talking to us. We’re taught to be great multitaskers. We surf the web while listening to music, at work we’re answering phone calls and sending emails, and if you’re a parent you’re the best of us all – cooking, cleaning, helping one child with homework while the other one is coloring on the wall. All which can be well – distracting. Here I imagine Mary sitting as she listens to Jesus’ words. And in the background comes noise from Martha who is so consumed in preparing for Jesus, that she misses Jesus’ presence! Martha, frustrated that Mary isn’t helping with any of the work, comes to Jesus asking Him to tell Mary to stop listening to Him to help her! However, to her surprise Jesus tells Martha this: only one thing is necessary now – hearing my words and fellowshipping with me. We need to prioritize. Let’s give God our undivided attention. All my life, I’ve lived about 10 minutes away from a train station – the biggest one in my county. When I was a little girl I remember hearing the trains coming in and out of the station. As a child, my friends and I would always say “another train is coming” and count how many we heard. However, as I got older it wasn’t exciting. Every time I heard a train come, I ignored it. Now, I don’t hear the trains – even when I’m outside on a quiet night. Why? Because I’ve trained myself to block out the sound. I’ve become unresponsive to it. With God’s voice, it works the same way. Every time we hear God speaking to us we must respond. 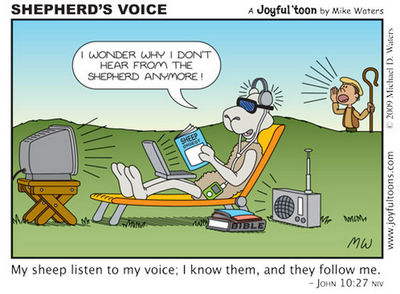 If we continuously ignore and become unresponsive to His voice, eventually we won’t hear it at all. So the next time you hear God speaking to you, respond. Don’t let His voice go unnoticed. If I were to ask you what prayer is what would you say? Think about it for a second. While I don’t know what you’re response is, it should have and must have consisted of these three words, talking and listening to God. Prayer isn’t just talking on and on and on to God about everything. And I know as much as God loves hearing from us, He also wants us to love hearing from Him. In your quiet time with God and after you’ve finished talking, do you listen out for His voice? Or do you quickly end your time with an “Amen” and proceed about your day? We can’t hear God if we aren’t listening out for Him.